I would like to close this chapter by looking at Matthew chapter 5. Books and books have been written about this chapter, so my few paragraphs aren’t going to do it justice. I will first break it down into the following sections, using a few illustrations. The inner red circle represents our salvation. Our inability to keep the commandments is why we need salvation. But the commandments themselves are, as Paul says, “holy, just, and good”. 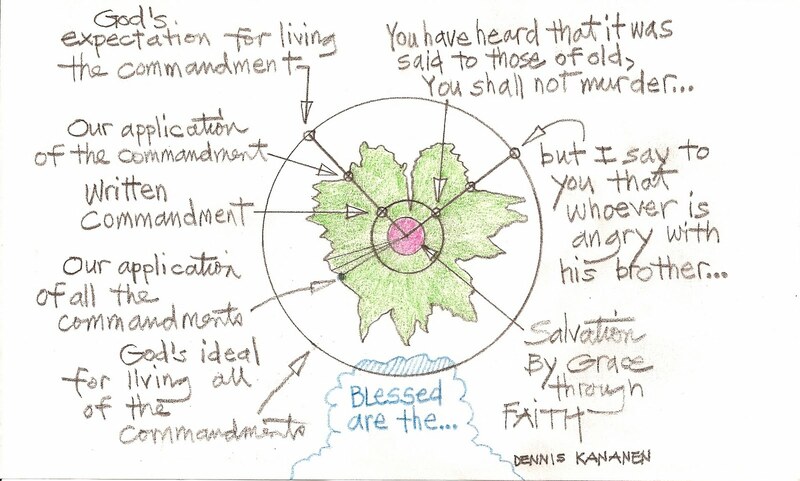 The next circle emanating from the center represents the commandments; imagine hundreds of dots on this circle, each one representing the written “letter of the law”. There are positive ones, negative ones, some for women and some for men, some only for those living in the land, etc. The question is how will “we” apply it? The outer circle joins together all of the responses that God hopes his people will have in applying the commandments. Each commandment has a line emanating from the center to the outer circle (2 are shown) which represents the sliding scale of the possible choices. The ragged green blob represents the joining together of all of the actual choices people make. The gap between what was intended and the actual sets the stage for Jesus' comments. In verses 21-48, Jesus goes over a few examples of the difference between the spirit and the letter of Torah. In so doing, Jesus engages the leaders as the consummate rabbi. In verses 1-16, Jesus speaks of some of the principles that define the Kingdom of Heaven. As interesting as these sections are, verses 17-20 have been the most understood. “The probable Hebrew equivalent of the Greek verb translated “to destroy” is levatel (literally, “to cancel”), which was used in scholarly rabbinic discussions of Jesus’ day as a technical term for violating a Biblical commandment. Verses 18 and 19 provide ample evidence that Jesus is serious about obeying the commandments. And yet, I’ve never heard one sermon on these verses! In my next post I'll summarize some of the principles that all of these verses and passages highlight. The goal is to help individuals and churches move from Torah Ignorant to Torah Friendly.